What is Community Supported Agriculture (CSA) ? Community Supported Agriculture is much different than going to the local grocery and buying your vegetables. It is a direct partnership between you (the consumer) and our farm (Saul and Diana Padilla). CSA members pay in advance for a share of the upcoming harvest and are ensured high-quality local produce; the farm is ensured a consistent market. 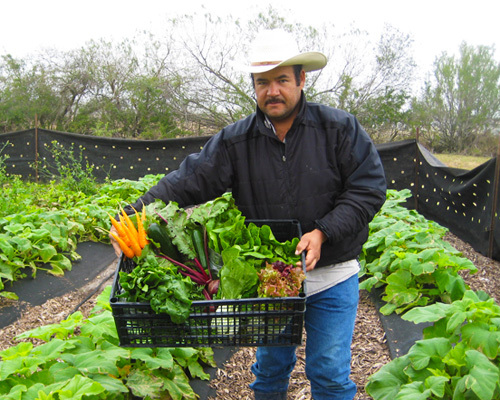 Produce is harvested directly from our fertile and USDA- certified organic vegetable fields, located south of Harlingen, just off Rangerville Road. Immediately after harvest we deliver “CSA shares (produce)” to our members’ homes and offices in Harlingen and San Benito, and to community pick-up locations in Brownsville, Harlingen, McAllen and Weslaco. CSA Season is November to May. Sign up now! CSA Season starts November and ends in May. Sign up now! In September we decide how many shares we will grow for; we make a intensive plan and offer shares of the vegetables we grow. We start purchasing our seeds prepare the soil and then we start planting in mid-September and continue until it gets too hot to plant. We plant from seed and transplant what we can to have a early start, most vegetables take around 45-100 days from seed to harvest. Your choice of a weekly or every-other-week delivery of seasonal USDA-certified organic vegetables, fruits and herbs bursting with flavor and freshly harvested from our fields. Invitations to Yahweh’s All Natural Farm and Garden member events, such as our annual Spring and Fall farm open house so you can see where your food is grown and meet the people who produce it. The option to add to your CSA share free-range eggs, goat, lamb and fruit when available. In addition, our website and Facebook page will share weekly a photo and a recipe with details about how to handle and store your produce. We will also share news from the farm and cover events and happenings in the local Harlingen food and farming community. You will also have access to our online recipe database, cooking and storage tips, and photos. You are invited to join us on Facebook. We grow over 40 different types of vegetables and herbs, and each week, members receive a “share” box filled with a variety of organically grown vegetables, fruits and herbs. The number of vegetables in your share will vary between 6 to 8. All of the vegetables come from Yahweh’s All Natural Farm and Garden directly and are USDA-certified organic. We select all of the vegetable varieties we grow based upon flavor, fruit abundance and adaptability. The contents of each week’s box can be found on our home page, and recipes using those items are included in our weekly Facebook posts. You can see photos of our recent CSA boxes. Example, (vegetables very per harvesting readiness) : 1.5 lbs of carrots, beets, 1.5 lbs of squash, 1.5 lbs of tomatoes , a bag of lettuce or two heads a bag of kale and a bunch of Swiss chard, citrus. We grow many vegetables and varieties of these vegetables like beets come in gold, candy strip and deep red. We grow broccoli and radishes etc. *Although it is save for you to eat your vegetable when you receive them because we do not use pesticides nor herbicides you should wash them before you use them to remove dust and natural elements as well as small pest because we do not us chemicals you may find in your produce. The best and freshest Certified Organic vegetables at a set price and our commitment to grow , and packaged ,deliver to you at a drop off location or for additional fee groups can be delivered to arranged locations. Why purchase a CSA: It supports our farm, Secure your share of produce, and you can be guaranteed you are purchasing certified organic locally grown produce for a better health from the inside out. 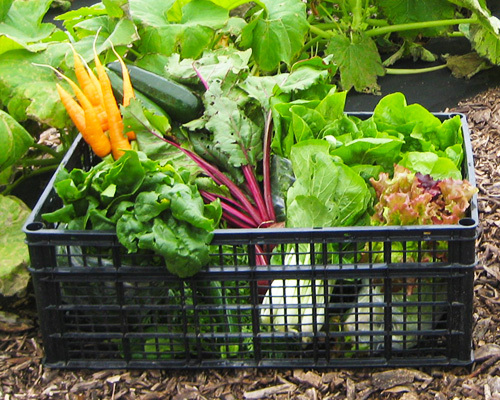 We began in 2008 providing CSA food to U vegetable boxes. We are proof that buying local helps local economy we have grown from a half acre in vegetables to 7 acres from a 15 acre farm to a 75 acre farm from no employees to Saul and Diana and one extra full time help and two part time. Buying our vegetables you get it just days from harvest and you learn how to eat in season. to start receiving and enjoying your organics straight from the farmer! Your New Healither Life Starts Now! Monthly payment options are available. Contact us for more information. If you prefer to apply to our CSA program by mail, click here to download the application.